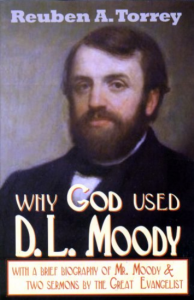 I came across this older booklet, written by Moody’s long-time associate, in a stack of old evangelism papers. I find this kind of reading, a refreshing break from much of the dry and dull informational writing today. It helped expand my illustration file quite a bit! Torrey’s eye-witness account of the life of the great evangelist, reminds us that God can use any person, even in our day, who is willing to yield to Him. He writes, “And I, for my part, do not think ‘it remains to be seen’ what God will do with a man who gives himself up wholly to Him. I think it has been seen already in D.L. Moody.” Well worth the short time!